Data analytics governance is the insurance you need to turn your data into a valuable business asset that creates competitive advantage and helps you EVOLVE your organization. Analytics data governance is an ongoing initiative with executive buy-in to establish strategic vision and oversight over the goals, communication, policies, processes, measurement, and management of data with the objective to empower decision makers with competitive analytics insights (i.e. operationalize analytics), build competitive advantage and reduce risks. Develop and disseminate data strategies, goals, policies, standards, processes, and KPIs. Establish roles, set expectations, and enforce accountability. 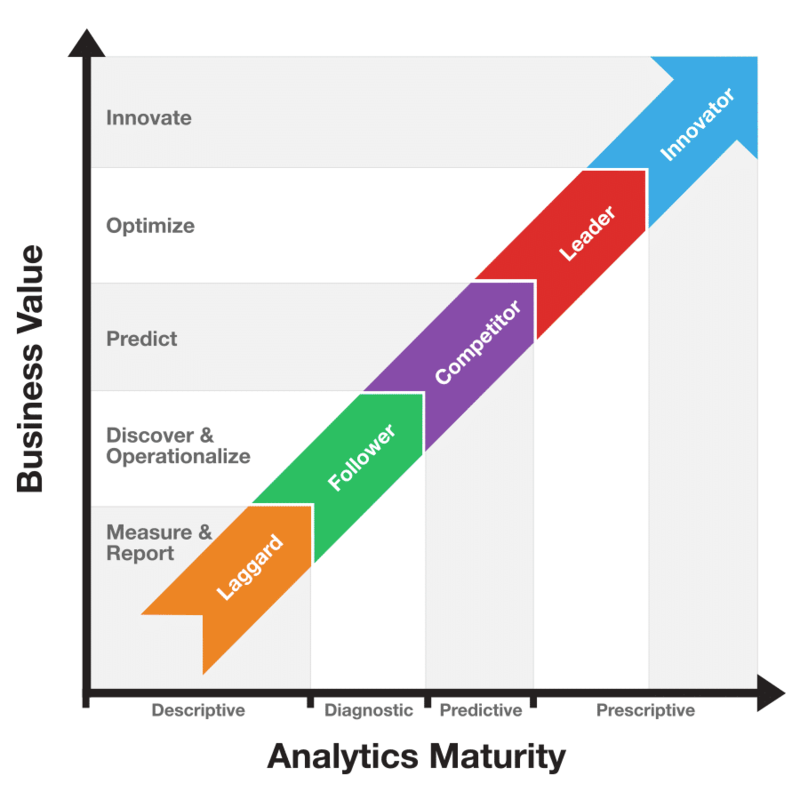 Manage and increase analytics maturity. Plan, sponsor, and oversee analytics projects. Manage data quality, and resolve data related issues. Promote the value of data and vision for analytics. Manage data mining models and tools. Provide training and best practices for decision-making. Share insights and results across the organization. Support self-serve analytics capabilities for business users. Learn about some of the ways we help clients be successful in analytics governance. Data governance can be complex and does not need to be implemented in one massive effort. Before starting, it’s essential to perform an Analytics Maturity Assessment to assess the current state of analytics maturity including the governance of data. With your strategic collaboration we will create a data analytics roadmap to achieving your short- and long-term goals. Improving your data analytics maturity often takes years and must always be maintained through organizational changes. An analytics steering committee oversees the use of analytics data and ensures it aligns to business goals and strategy. Considering that data governance involves immense cultural changes it requires stakeholders with strong influence and decision making power from the various functional areas, business units, and external professional service agencies. Data governance initiatives have a higher probability of success when you have these influential stakeholders ensuring company-wide support! Developing data management standards that enforce reliable and quality data data collection are vital. We’ll help you develop and manage a data dictionary, data layer, workflows for your tag management, automated QA monitoring, disaster recovery plan, and more. When providing business analytics consulting services we always advise on implementing an online wiki based analytics Center of Excellence (CoE), which is essential to establish alignment, build the internal analytics community, and ensure accessibility of documented policies, best practices, training, processes, tools, and other resources. The Measurement For Success framework is another collaborative exercise that we will guide you through to obtain stakeholder alignment on the definition of success, and identify what should be measured to evaluate and improve performance. This proven process documents your measurement objectives, goals, KPIs, segments, benchmarks, targets, and data sources. This ultimately leads to the execution of dashboards and data visualizations that align to your business units, user personas, and customer journeys, as relevant. Addressing one of the organizational risks we mentioned, please review the case study on how analytics data governance driven processes addressed PR issues related to concerns around user privacy and the use of digital analytics data on Healthcare.gov. With our support, CMS was the first US government site to implement this extra layer of security, demonstrating a commitment to their users by giving them a choice about controlling their privacy options. Contact us to learn how data governance is the key to operationalize analytics, hold people accountable, become data-driven, turn your data into a valuable business asset that builds competitive advantage and supports leaders like you to EVOLVE your organization. If you have questions or are ready to discuss how Data Governance Consulting can help you EVOLVE your organization, talk to a Blast Solutions Consultant today.